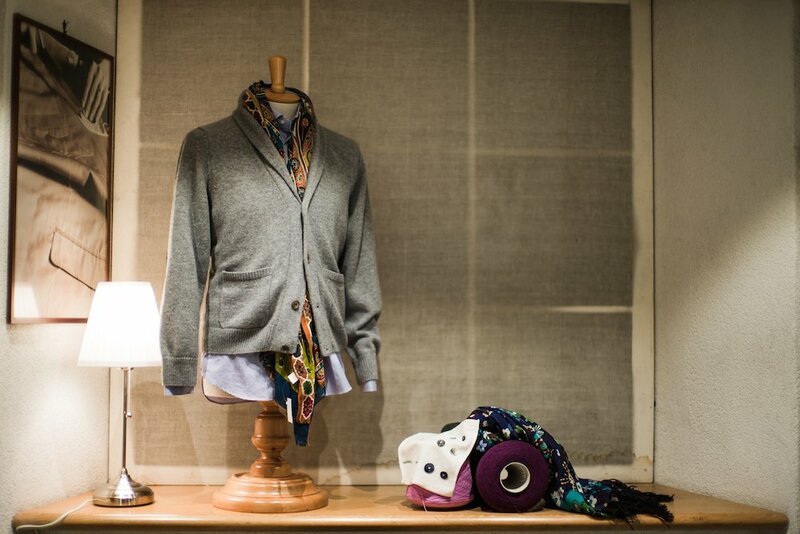 Simone Abbarchi is a Florence-based shirtmaker that has made for my friend Tommaso Capozzoli for a long time. He has always said that they have a very good relationship between price and quality, and he’s right. Simone’s are of course all made to specific measurements, so the fit is a lot better, and they have the Italian collar construction that so many readers will like: lightly fused lining, which curls around the collar of a jacket when the neck is undone, and yet sits stiff enough with a tie when the neck is fastened. Simone’s shirts are so reasonable, in part, because they have no handwork. The buttons are sewn on by hand, but that’s it. As I’ve discussed before, I prefer a hand-attached collar and sleeve, but you pay more for that – around €220 in the case of Luca Avitabile. The made-to-measure offering involves no paper pattern, and you should expect small aspects of the fit to be not as good (as for all MTM, it’s about 2D changes rather than 3D). But this is far less important on shirts than tailoring. Bespoke, as with other makers, does involve a pattern and also has a fitting on a partially made shirt. MTM shirts are usually finished and sent straight to the customer. For anyone that hasn’t looked into this area before, it’s worth reading my breakdown of D’Avino shirts, which presents these three names as three tiers of construction. 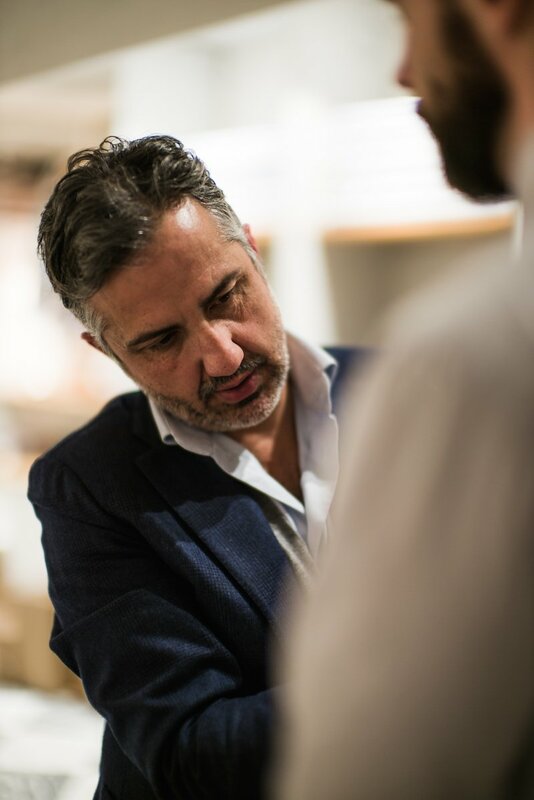 Another good thing about Simone (or Gianluca Cocchetti, who works with him and is pictured here) is that he already visits both London and New York. He has a good few clients in both locations, and so comes over twice a year to each – February and September for London, and March and October for New York. He doesn’t have a minimum for an order, and will usually do two fittings for a first shirt, but can just do one. If you’re unlikely to travel to Florence, perhaps best to just do one, and accept there might be tiny things you’ll change next time. 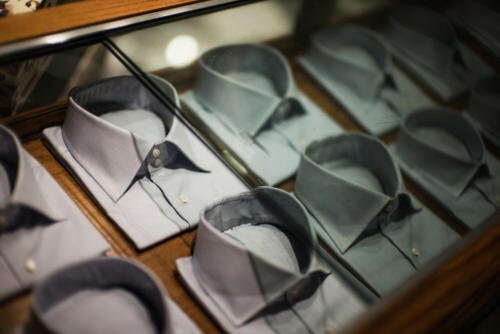 For anyone just getting into bespoke and MTM shirts, or indeed looking for a much better alternative to the British/American high street, hopefully Simone will be a great choice. You can follow the discussion on Simone Abbarchi shirts, Florence by entering your email address in the box below. You will then receive an email every time a new comment is added. These will also contain a link to a page where you can stop the alerts, and remove all of your related data from the site. Simon, perhaps you can clarify. My understanding was that Simone was very much a made to measure operation (as indicated also on his website). Happy to be corrected on this. He made me a shirt a short while ago. Unfortunately the fit was not particularly good off the bat. I think it’s worth noting that his standard procedure if you meet him in London is to take the measurements and then mail you the finished shirt without a fitting. Perhaps you can request one, but it wasn’t mentioned. Having said that, I will likely give him another shot. Simone is a really personable guy and the price is exceptional. A moot point perhaps, but the monogram stitching is nicer in my opinion than on my shirts from Luca Avitabile. No you’re right – there is no paper pattern so made to measure is more accurate. Have clarified now. Interesting on the procedure – I had a fitting on a partially made shirt, but you never know whether these things are the same for everyone. Alex, it turns out there was a reason for our confusion. Simone does both bespoke and MTM and did bespoke for me. The only differences are the paper pattern and the fitting I had. Off-topic, I just had my Permanent Style 2015 book delivered by post. I am thoroughly impressed and the quality has far exceeded my expectations. The layout and large colour photographs in particular are fantastic. It will make a fine coffee table tome after I am done re-reading the articles I want to. A fitting tribute to the legacy of the website. I should also mention that the purchasing and delivery process from the Hangar Project was excellent. They delivered from the USA in just a few days for the same price as a pint of lager costs. I would recommend this route to anyone who cannot make it to a physical retailer of the product. Thanks Simon. 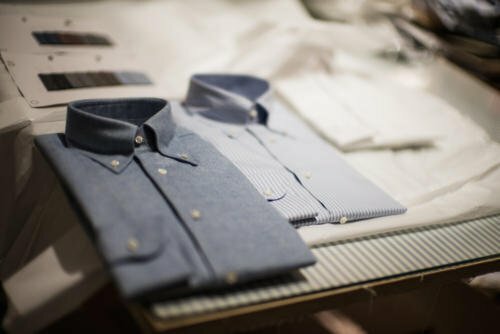 Simply to clarify one aspect that I have always struggled with in shirt making: as far as I understand and have been told by some tailors, the attaching of the sleeves is purely aesthetic, as the sleeve will always be attached by machine for stability reasons and then the remaining fabric inside will be attached by hand. What is your knowledge on this? They’re right Laurent, the sleeve is attached first by machine (though the amount of excess worked in here will also vary). The hand work on the sleeve is more important for the way the seam is finished – often with a wider, flatter seam on the top of the shoulder that is softer and more comfortable. Thanks for the post Simon, and good timing as I’m looking forward to his visit in September and having my first shirt made by him having been persuaded by your previous post. An extra €30 doesn’t seem like much of a jump to bespoke? I prefer the idea of having a pattern made up, though would you say I’d get much benefit from that if I couldn’t get to Florence for a fitting? I suppose it’s mostly about timing. 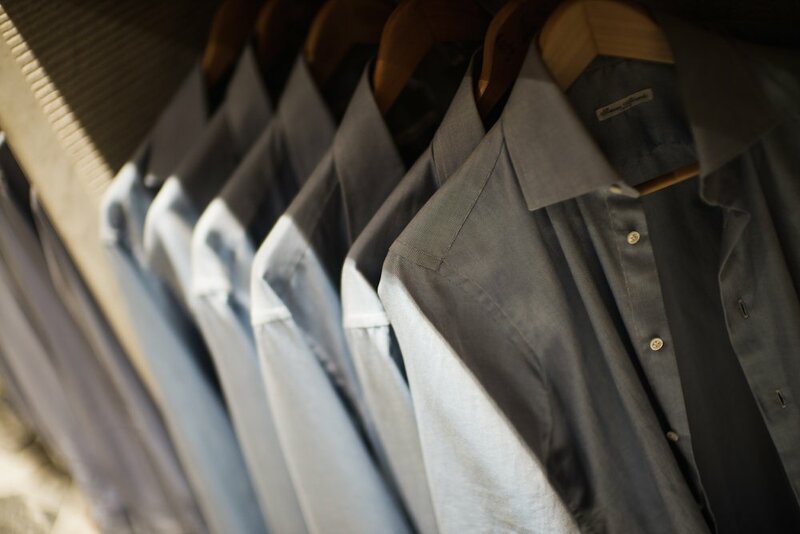 Chances are a bespoke shirt would fit better, but you’d have to wait until after the next visit to get it. It’s not much more for bespoke, no. Very attractive pricing-thanks for clarifying the MTM/bespoke question. Off topic, but could Simon shed any light on the closure of Hayward on Mount St? I walked past yesterday for the first time in a while and the shop was completely empty! Do you know where Len from Dougie Hayward went on to? As a student at LCF 20 years ago, I did some work experience there. Thank you for the post and I’m looking forward to your view. I did reach out to be put on their NYC mailing list and received a prompt supply from Simone. Good to hear about his MTM sweater service. I’ve been looking for a light, fitted button down sweater for putting under jackets. They’ve been tough to find in shorter lengths. I think I’ll give Abbarchi a whirl. I’ve been making do with Brioni, Zegna, Dunhill and the like off the peg and having them adjusted. Although they’ve all got some nice cloths I’ve always felt their pricing was for the read and laugh file. That said, my bespoke shirt adventures have been nothing short of catastrophic so maybe these guys are the answer. Ps. You one talked about the perfect long sleeved Polo shirt to wear under a coat but I can’t find the blog. What was your recommendation? Any experience/knowledge of Copperfields in Moorgate? Saw a suit in the window (it was closed) that I really liked, decently priced, but would like to hear opinions on quality. I read online they are family-owned and very committed to their work. To be honest I wouldn’t recommend it. It’s hard enough to tell the fit of a suit from a picture, let alone a shirt. I always say that whenever I post a photo, it is purely indicative. Readers have to rely, if they want to, on my descriptions and experience. It’s best to go off more general descriptions – such as being able to get two fingers but no more inside the collar when buttoned, or having the waist close but still be able to easily sit down and slump in it. I could do a post on those points if that would be helpful? Thanks for getting back to me. The fit is perfect everywhere apart from around the back of the armhole. The back panel of the shirt appears to overlap the back of the sleeve head. If you were to look from the back you’d see there was excess that folds over where the yoke area meets the sleeve. Hope I’ve explained it ok.
I’ve worked with Simone for a couple of years now. Really happy with the results. He did one fitting after my initial meeting where I was measured (in Firenze). Then he made up one shirt for me which I made some adjustments to for my second shirt. This shirt was pretty spot on and I was then confident to order batches of shirts, usually I make them up 4-6 at a time whenever I’m in Firenze. I’ve come to replace all my old worn shirts with Abbarchi shirts. Very good price and quality relationship as mentioned. 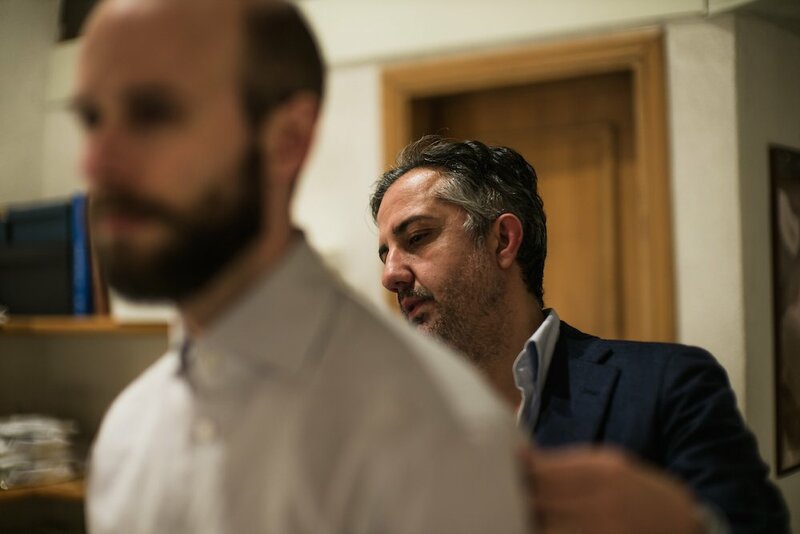 Simone may give an impression of being a bit stressed or hurried during a fitting but he’s not, it’s just his personality, he has never made a single mistake on any of my orders. I’m a very satisfied client. Best to check their individual sites, though we do have a calendar coming soon. I noticed you used the term, “lightly fused lining”. Does that refer to a type of fusing process that is less stiff than normal fusing or the lightness of the interlining used, or both? Do you think some of the British bespoke shirting prices is a bit of a con? Reason I ask is that it seems some of the actual shirtmakers move from one maker to the next often? I had shirts done by David Gale years ago when he was at Sulka and then Dunhill. It’s funny how we talked about how we both thought Turnbull and Asser is not truly bespoke anymore as their pattern making is more MTM than bespoke and their sleeves are basically an existing pattern. What’s weird is in that time David Gale has gone back to Turnbull & Asser and Hilditch & Key and taught Wil Whiting. On prices, no not particularly. It’s just that they have to be in London, which has huge rents compared to Florence, Naples or somewhere else. That’s always going to be part of what you’re paying for. What are current prices for Simone Abbarchi MTM and bespoke? I think he starts at €300. Really Joel? That would be a big increase – for bespoke rather than MTM? Sorry, I got that completely wrong. 150 for MTM and 180 for bespoke.